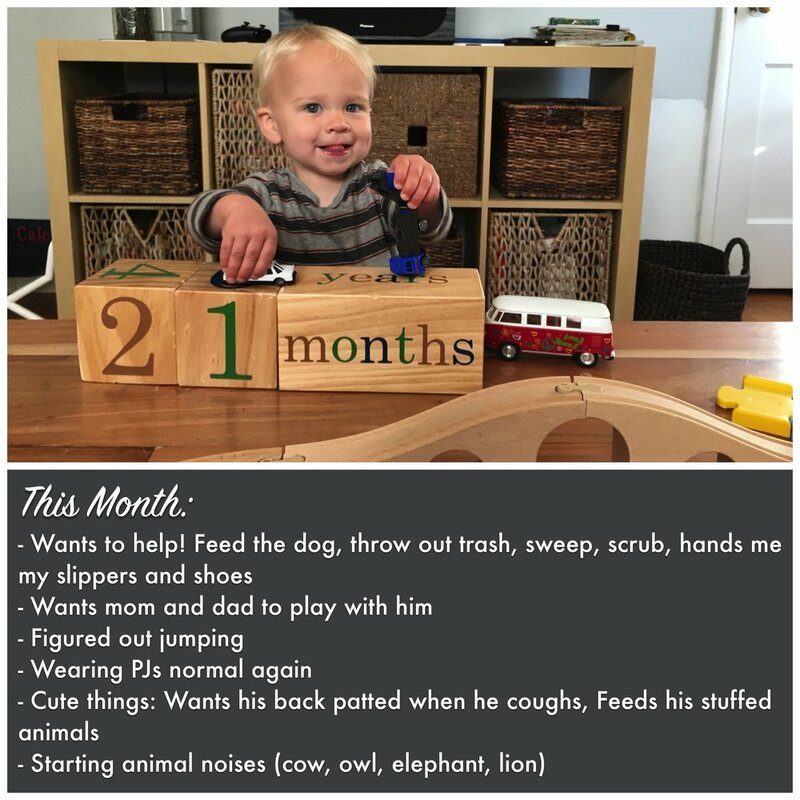 22 months is just two months away from two years old. Not only is that a lot of two's to say in one sentence, but also crazy to think we'll have a two year old on our hands very soon. Will two be terrible? He's definitely got a personality of his own, but is pretty darn sweet most of the time (with some crazy toddler interspersed). I do have to say, though, that this is Caleb's world and we're just living in it. Luckily, he makes a pretty fantastic world. He likes to build and knock down the month blocks these days. He is so proud when he stacks them. Those are proud faces in the photo. For Caleb Parks and Recreation isn't a TV show, but real life. 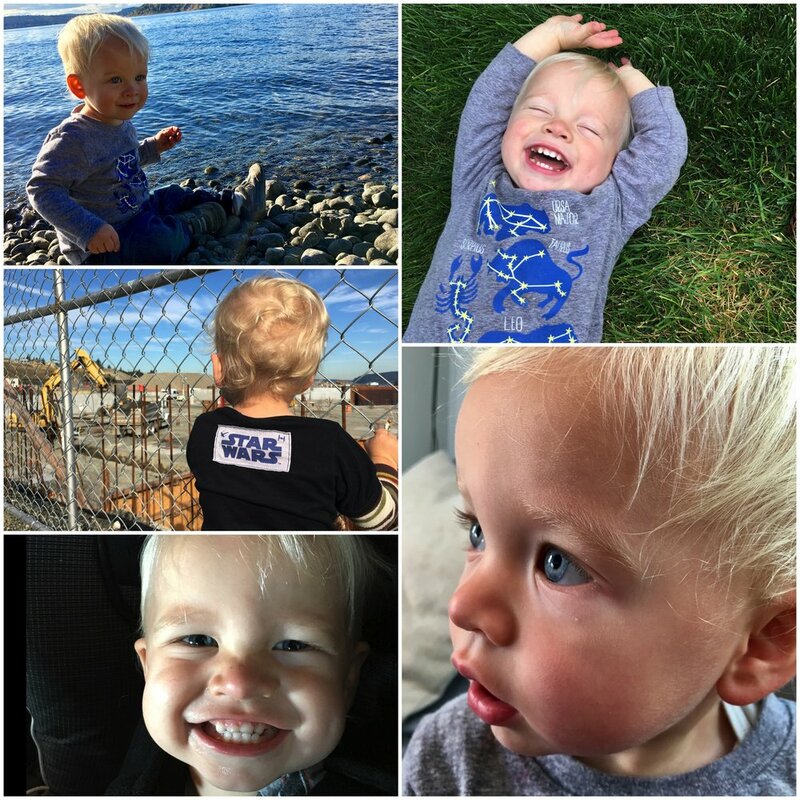 This month he discovered the joy of trampolines and obstacle courses at the YMCA toddler open gym time. He also loves piles of leaves and puddles, but he refuses to wear his jacket! His smile warms my heart. It's amazing what I'll do to get him to laugh. He still does the "stink face" when asked (see bottom left photo). He enjoys rolling in the grass and throwing stones into the water. Of course, we need to check out any construction site as well. Oh my goodness does Caleb love Asha. He wants to walk the dog, feed the dog, hug the dog, and sit wth the dog. When we first get home, he needs to greet the dog. And he's very motivated when you say, "let's go see the doggie, Asha." He loves other dogs when we're out and about, as well. In fact, he'll call out "doggie!" at the top of in lungs while running around. He discovered pumpkins this year and points to them whenever we say pumpkin. 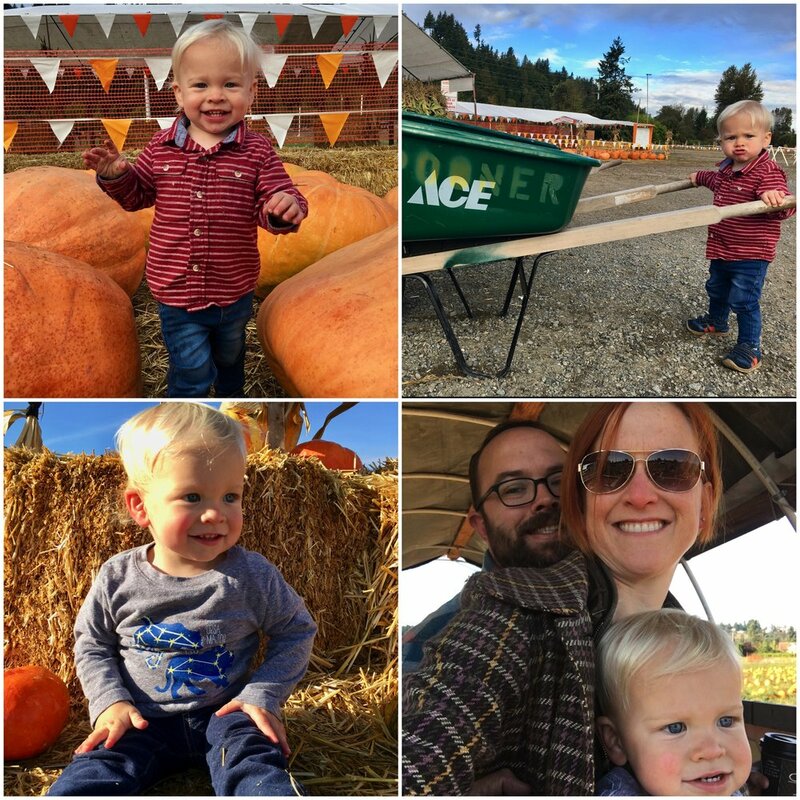 We enjoyed pumpkin patches and got to visit Spooner Farms and Picha's Farms. 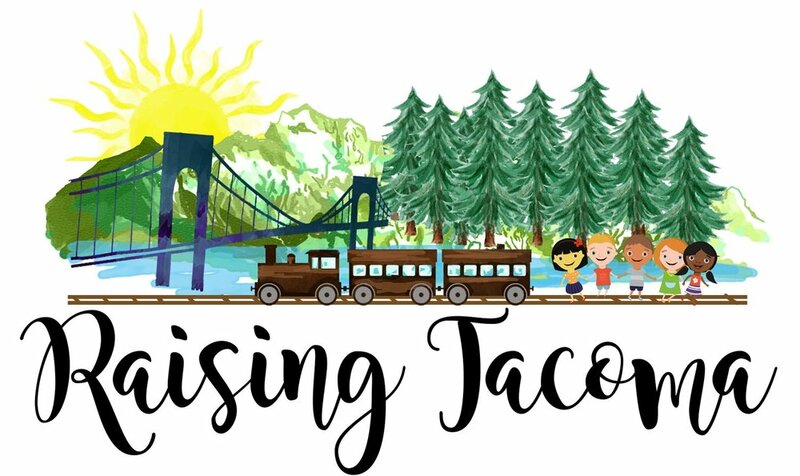 Read about it here! He also enjoyed wheelbarrows. Our favorites times are playtimes with buddies. He's really starting to play with others rather than alongside them. We joined friends at parks, zoos, at homes, at pumpkin patches, or the Children's Museum. Fun with friends is the best! No stroller. No no no no no no no. But the walker toy is a big YES. He is a machine with the walker and he can go crazy fast with it. It just had to come on walks. Then we were gifted the radio flyer stroller/pusher and that maybe became just as awesome as the walker. And that's a monthly wrap. As they would say on one of Caleb's favorite shows, Chuggington, time is just chug chug chugging along!